Film Review: "Don't Breathe" (2016). "This house looked like an easy target. Until they found what was inside." This is Don't Breathe. This horror film directed by Fede Alvarez and written by Alvarez and Rodo Savages. The film follows a trio of reckless thieves who break into the house of a wealthy blind man, thinking they'll get away with the perfect heist. But they're wrong, now the group must find a way to escape his home before they become his newest victims. Due to the criticisms received for his previous film Evil Dead (2013), Alvarez decided to make an original story, that contained little blood and more suspense, as a follow up instead of an intended sequel. He wanted to avoid making a film dealing with the supernatural, as he felt that was too trendy. Instead opted to make a reality-based film. Alvarez explained, "Sometimes you naturally give them powers and make them more menacing than a normal person, so we thought what if we do the other way around and take his eyes out and make him a blind person." Alvarez has called the movie "exercise in reversal" noting that the film deliberately subverts tropes such as the fact that the house in question is a " nice house on a scary street" as opposed to the opposite, or that the movie is a home invasion story told from the point of view of the invaders. The film ilm was originally titled A Man in the Dark. The finalised title was not revealed until its premiere at SXSW 2016. By mid June 2015, Daniel Zovatto, Dylan Minnette, Jane Levy and Stephen Lang were cast. Principal photography began in late June 2015. The film was primarily shot in Hungary, even though the film is set in Detroit. This put the film's budget roughly half the cost of Evil Dead and allowed less interference from the studio. The film stars Jane Levy, Dylan Minnette, Daniel Zovatto and Stephen Lang. The cast gave genuinely intense performances. It is because of this that made it all the more interesting, especially when the roles of love-to-hate burglars and an empathetic victim have been reversed. Where you empathise for the trio and dread the old blind man. Kudos to Lang especially for pulling off an amazingly terrifying performance for a character who is blind. Never in my life have I ever been terrified of a blind man. It may lack the originality that the marketing campaign had led us to believe, but Don't Breathe compensates with brutal terror, intense scares, and shocking moments. The film is amazingly intense and fun, as well as terrifying, exhilarating and relentless. It may be the most unrelenting and shocking horror film to come out of a major studio in a very long time. In the end, it may not be wildly inventive nor the best film of the year, but it is certainly effective and it does its job. I love horror films that truly shock, scare and provoke, and this film is one of them. Also, see my review for Evil Dead. 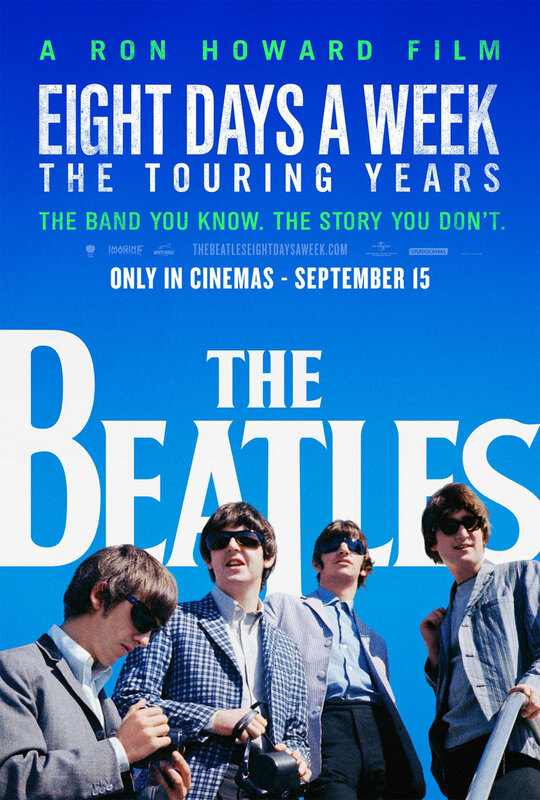 Film Review: "The Beatles: Eight Days a Week - The Touring Years" (2016). The tagline of the film reads "The band you know. The story you don't." This Beatles story is just that. The Beatles: Eight Days a Week - The Touring Years. This is This documentary film directed by Ron Howard. The film is a compilation of found footage featuring music, interviews, and tells the stories of The Beatles' career and their 250 concerts during their touring years from 1962–1966, from their performances at the Cavern Club in Liverpool to their final concert in San Francisco in 1966. The genesis of the film arose from Ron Howard's association with Nigel Sinclair who'd been an executive producer on Howard's Rush (2013). Sinclair, who produced his share of rockumentaries (Martin Scorsese's George Harrison: Living in the Material World (2011) and others), had been impressed with Howard's music documentary Made in America (2013), "a reflection of the fabric of what it means to be 'Made in America'...", and simply invited him into process. Howard's love affair with The Beatles began at age 10 when he first saw them on The Ed Sullivan Show on 9th February 1964 (ep: The Ed Sullivan Show: Episode #17.19 (1964)). His first fan request was for a Beatle wig. The title of the film was named after the band's 1964 song of the same name. The song was released in December 1964 on the album Beatles for Sale. It went on to become one of the seven Beatles song to stay on top in the U.S. charts for a year. The inspiration of the song is an interesting story in of itself. The song's title was a result of happenstance for which Paul McCartney claims credit. McCartney had been banned from driving due to a speeding violation and while traveling to John Lennon's home in a chauffeur-driven car one day he idly asked the driver if he'd been working hard. The driver responded dryly, "Eight days a week". The Beatles: Eight Days a Week - The Touring Years is one of the best insights into one of the greatest musical giants, and the moments that defined a generation. The cast honesty contributes mightily to Howard's portrait of a group of artists more interesting than some of us may have realised. Seeing the film is like revisiting an old passion and realising the heat is still there. Despite director Howard mostly focusing on the band and its fans, trying to search for something elusive - something that only comes around once in a lifetime, the film suffers from the standard narrative associated in documentaries. It is a film that sheds a lot of light on its subject but at times can be a little too blissed out for its own good. Even though it's not a film one particularly expected to be made but it's a vastly welcome one. In the end, it is an essential documentary to the annals of music history. It is one of the great documentary experiences that shouldn't be missed. Also, see my review for In the Heart of the Sea. Film Review: "Sausage Party" (2016). 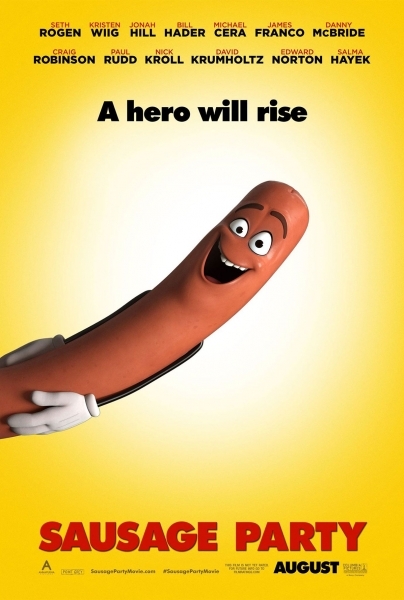 One of the film's tagline reads "Not your usual kids movie", which is exactly what Sausage Party is. This adult computer-animated comedy film directed by Greg Tiernan & Conrad Vernon, and written by Kyle Hunter, Ariel Shaffir, Seth Rogen & Evan Goldberg. A parody of Disney and Pixar animated films, the film follows a sausage who tries to discover the truth about his existence and goes on a journey with his friends to escape their fate. After South Park: Bigger, Longer & Uncut (1999), the film is the first CGI-animated film to be rated R by the MPAA. Seth Rogen first developed the idea of the film back in 2007. It was based on something he and Jonah Hill joked around about. While promoting Superbad (2007) and Knocked Up (2007), people would ask Rogen what his next project will be, in which he jokingly replied "It's called 'Sausage Party'". Rogen later described the film as a dark take on Disney films, saying, "People like to project their emotions onto the things around them: their toys, their cars, their pets... So we thought, 'What would it be like if our food had feelings?' We very quickly realized that it would be fucked up." It's because of the dark nature of the story, Rogen worked and fought for eight years to get it picked up by film studios. Until it was finally formally announced in September 2013 as a joint project between Sony Pictures Entertainment, Annapurna Pictures and Point Grey Pictures. The film was finally given the green light with a budget of $20 million, as opposed to most Pixar and other animated movies, this was considered a particularly small budget for a CG animated feature. According to Rogen, the film was intended to be made as inexpensively as possible and the CGI was not supposed to look polished. Like most Rogen-Goldberg films, this film did not come without its controversies. The red band trailer for the film was accidentally shown in a screening of Finding Dory (2016) at Brenden Concord cinemas in Concord, California, horrifying young audiences. The incident occurred only once, and the theater apologized, with Rogen tweeting that the story "made his day". It stars an ensemble voice cast that includes Rogen, Kristen Wiig, Jonah Hill, Bill Hader, Michael Cera, James Franco, Danny McBride, Craig Robinson, Paul Rudd, Nick Kroll, David Krumholtz, Edward Norton and Salma Hayek. Like This is the End, the film was jam-packed with energetic, hilarious and surprising performances from the cast. Its jokes are profoundly bold and rude but incredibly funny at the same time. With Sausage Party, you could sit through a year's worth of Hollywood animated features and still not see anything that's genuinely knock-your-socks-off audacious. But the film truly is. It's the wildest animated feature, since South Park: Bigger, Longer & Uncut, that is not afraid to be the most fearlessly audacious and the snort-out-loud funniest. However, the film ultimately fails short for animated greatness due to its lazy, overly gratuitous and ridiculous last 15 minutes.